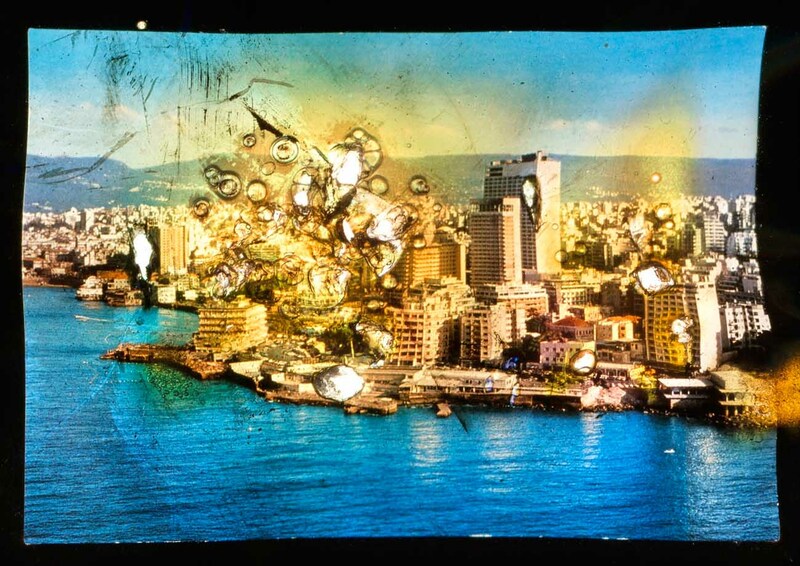 The Story of a Pyromaniac photographer is the first part of the Wonder Beirut project based on the collection of a fictional Lebanese photographer named Abdallah Farah. Between 1968 and 1969, Abdallah Farah was commissioned by the Lebanese State to take pictures to be edited as post cards. They represented the Beirut Central District and mainly the Lebanese Riviera and its luxury hotels, which contributed to form an idealised picture of Lebanon in the sixties. Those same postcards are still on sale nowadays, although most of the places they represent were destroyed during the armed conflicts. As of the Autumn of 1975, Abdallah Farah systematically burned the negatives of the postcards, in accordance with the damages caused to the sites by the shelling and street fights. Abdallah used to photograph the image after each new burn he inflicted on it, producing a series of evolving images, which are called the “process”. Two types of processes are to be distinguished. The first called the “Historical process” follows very faithfully the events (the “War of the hotels”). The second derives from the impacts which Abdallah inflicted wilfully or accidentally to certain images which are grouped under the name “Plastic process” (the war postcards).